What do you think of when you hear the word casserole? For me it brings up memories of the first meal I was responsible for cooking when I was a kid. I remember that chicken noodle casserole so well. It had instant milk, instant broth, and I’m pretty sure if there was such a thing as instant chicken it would have been in there too (almost, it called for canned chicken). Put it all in the dish, sprinkle it with canned parmesan, and bake. It is something I am absolutely certain I would never make again. That is not the case with this Crab Casserole for Two. Casseroles were very popular years ago. Or should I say decades ago? I recall potlucks back in the 70’s and 80’s were tables lined from one end to the other with them. Everyone had their favorite. I can’t tell you how many casserole dishes I received as wedding gifts. I still have a lot of those dishes today. My collection keeps growing. The dish I baked the crab casserole for two in is one I purchased recently. The dishes may be labeled with other names like gratin or baker however they are basically the same thing. Crab is a very special treat. The price alone keeps it from being a regular item on the grocery list. It is splurge-worthy though. Every now and then I get a hankering for it and usually wind up making crab cakes. Even those usually call for a pound of crab and that gets in the way of making it for just the two of us. It is the reason I was hooked the moment I ran across a recipe for a casserole for two. It has all the factors of crab cakes I like (breading and lots of crab) along with the ease of baking it in one dish. How is the crab casserole? It is chock full of crab and held together with breadcrumbs, butter, cream, egg, and light seasoning. It is not a creamy-like casserole. It is like a big crab cake in a way. The only real difference is extra breading on top. There isn’t any need to serve it with bread because there is plenty inside. A simple green salad with it would be a lovely meal for a special evening. Do you enjoy casseroles? If so, it is your lucky day. Scroll down to find a list of recipes by my fellow Sunday Supper bloggers. This week our theme is captivating casseroles and I can already spot some that captivated me just by the title. I’m looking forward to checking out each one. Thanks to Alice of A Mama, Baby & Shar-pei in the Kitchen for hosting. Oh, and to end a meal for two you need a dessert for two so take a look at Baked Custard. 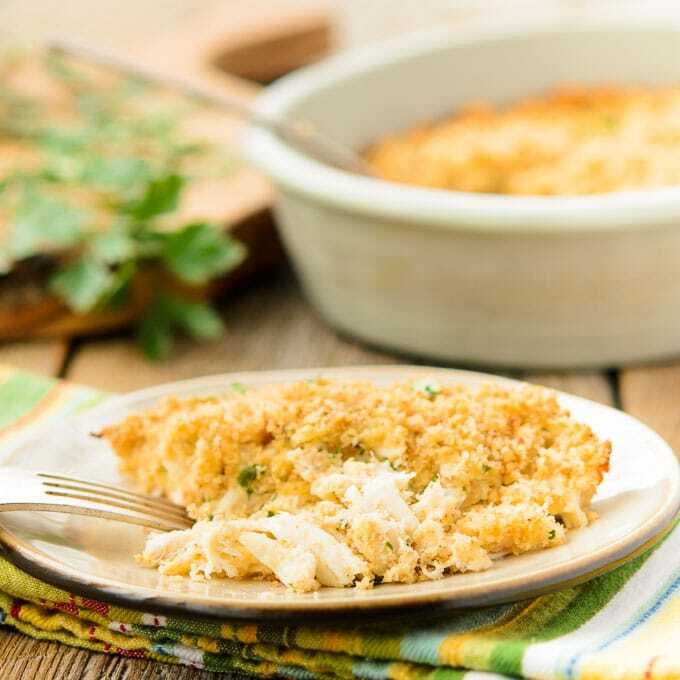 This crab casserole for two is a wonderful meal for a special occasion. 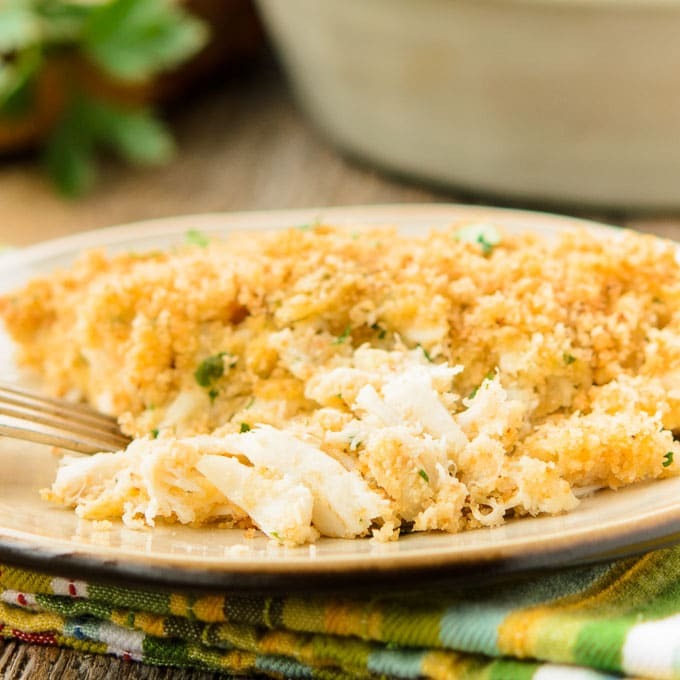 It is loaded with crab, topped with breadcrumbs, and lightly seasoned. Preheat oven to 350°F. Lightly grease or butter a 1-quart casserole dish. Whisk together egg, parsley, mustard, salt, and pepper. Melt 3 tablespoons butter in a medium sauce pan over medium heat. Add 1/2 cup breadcrumbs and half-and-half. Cook until slightly thickened, stirring constantly. Remove from heat and add egg mixture, stirring rapidly while adding so the egg is incorporated in without cooking/scrambling in the pan. Stir in crabmeat. Pour mixture into prepared casserole dish and spread evenly in the dish. Melt remaining 1 tablespoon butter and stir in remaining 1/4 cup breadcrumbs. Sprinkle evenly over casserole. Recipe adapted from one in the Southern Living Cookbook For Two published in 1981 (no longer in print). What an elegant casserole, Renee! It sounds scrumptious—no instant anything in sight!!! This is totally my kind of casserole. I love crab cakes! I love crab and this sounds perfect! This is very like my aunt’s crab casserole and it’s one of my favorite things to make and eat. When we were little ,fresh crab wasn’t so expensive in southern Louisiana as it is now so we had it more often. Good choice for a captivating casserole, Renee! I’ll tell you this — I don’t think of this when I think of casseroles. This is way beyond your everyday casserole! Outstanding! SUch a pretty casserole Renee! I’ve always thought of it as a winter dish, but this would be perfect in the springtime! I too think of my childhood when it comes to casseroles. I believe Tuna Casserole was one of the first things I made as well 😉 So happy for grown up versions like this Crab Casserole! YUM ME! I love that you don’t have to make a ton in order to get a great result. Thanks for sharing! I splurge on crab two or three times a year — usually when it’s on sale or we just get a huge craving for crab cakes. I love that this can be made with the smaller container of crab. Since there’s just two of us at my house, this would be a perfect Valentine recipe for us! Now that I live in Maryland, I have to get on the crab bandwagon. This looks awesome! Oh Renee, I just love this. I’m a huge fan of crab, so this is exactly what I would want in a casserole. Pinning!!! Decadent! 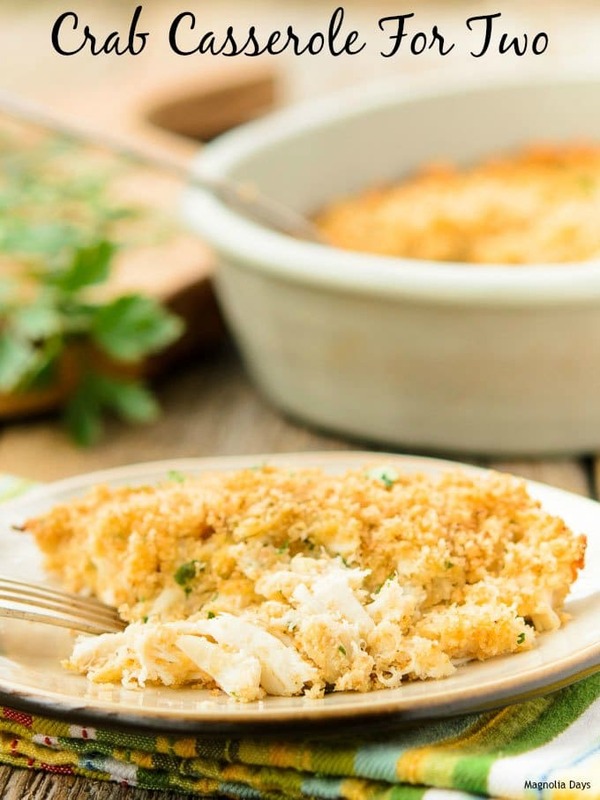 I love crab and I’m thinking this would make a delicious Valentines dinner as well….yum! You had me at crab. I’ve been hankering for some crab lately. I may have to remedy this with your casserole. I adore crab, I would love this! I love that this is romantic! I love that it is elegant! I love that it looks so comforting, and I really love that it’s a great option for my clients with just two diners in the house! Beautiful casserole! We also only get crab for special occasions which is hard because we live in Maryland where Maryland fresh crab is available all year long. 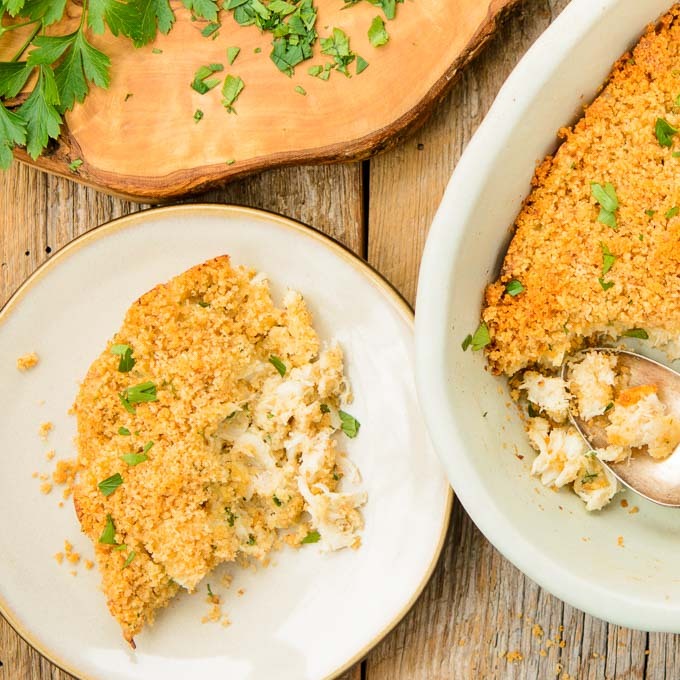 My husband would absolutely love this crab casserole…I’m thinking maybe Valentine’s Day! I couldn’t wait to see this recipe. I have been drooling over the picture. It was a fabulous idea to use crab. I cannot wait to try it. There are so many reasons why I love this casserole. I need this on my dinner plate ASAP! Casseroles are the perfect make-ahead comfort food! Your crab casserole looks just lovely. What a gorgeous casserole! My husband would adore this…perfect for our Valentine’s menu! You should have called this Heaven in a dish! Omg I just love this. It’s a huge crab cake that you don’t have to worry about falling apart when you flip or being to soggy! I’m in love! Crab served up this way works for me! I remember so many of those casseroles from years ago and am so thankful that fresh ingredients were ‘discovered’! Your Crab Casserole is beautiful to look at and I look forward to making it here. I may even use it as an appetizer, too! I know I don’t eat fish but go figure I love crab cakes I bet I’d like this!! The topping looks amazing! Oh my heavens, this looks SO GOOD! It’s so nice that this is just for two. Sometimes casseroles are so big and I just don’t want all those leftovers. Crab is a favorite in our house! This would be devoured but I probably should make it for 6 so the kids don’t feel left out! Delish! We like a bit more zing so added a tap of old bay and a bit more pepper. We mixed a bit of parm reg with the bread crumbs.